A while back I was contacted to try a new topical hemp (CBD) oil-containing lotion. Resonant Botanicals sent me two of their new CBD lotions for pain relief and anxiety relief to try and review. I started off with CBD lotions from Fay Farm, and Resonant Botanicals was started by one of the original founders of that company. With that in mind, I had an idea that these would be good products, but I wasn’t sure if they’d really be different or better. They sent me their first two lotion products, Invigorate and Qi of Calm. Invigorate lotion is Resonant Botanicals pain-relief lotion. It’s made to reduce stiffness and ease aching joints. In my daily life I tend more towards really soft mild scents, the kind you can barely tell are there. This wasn’t one of those scents. It’s a bit more on the earthy/spicy side of the scent spectrum. I’d almost say it’s a bit more of a masculine fragrance, so I wasn’t really to wear it out in public. I tried it a few times at night just to see how my body would respond to it, would it ease achy muscles? Would it help me sleep? I can’t say I noticed a whole lot initially. One afternoon I’d been fighting a migraine all morning. My prescription migraine meds weren’t really doing a lot to help, and I had things to do. My neck and shoulders were super tight as they often are when I have a migraine, and for some reason the thought just hit me to try some Invigorate to see if it would help calm things down. Within about 5 minutes of covering my neck and shoulders in Invigorate lotion by Resonant Botanicals, the migraine had almost disappeared. My neck and shoulders relaxed and were not longer tight, tense, and hurting, and with that relaxation the migraine just about completely disappeared. Since that day I’ve continued to use Invigorate when my muscles tight and I notice it pretty much always calms them down. I also use it pretty much daily now. But, instead of using it at night, I use it in the morning after my shower. Now, I just need to find a way to apply it to those hard to reach places down my back. Qi of Calm (now called Calm Day) is Resonant Botanicals anti-anxiety lotion. The lotion purposefully combines essential oils and CBD oil to help relieve stress and anxiety. The scent of Qi of Calm is one that I really enjoy. It has light tones of lavender (my favorite) and chamomile. You’re directed to apply this lotion over your spleen (just below the bottom left rib), as well as on the lymph nodes (on your neck and under your chin). In addition to reducing stress and easing anxiety (which it does), what I’ve found it most helpful for is relieving the dry, burning feeling in my hands and feet. This burning related to small fiber poly neuropathy usually hits me at bedtime, just as I’m trying to relax and go to sleep. I find that applying Qi of Calm to my hands and feet before bed staves off this burning pain. If I forget to apply it and the burning feeling starts up, applying Qi of Calm will calm the pain down so that I can relax and go to sleep. 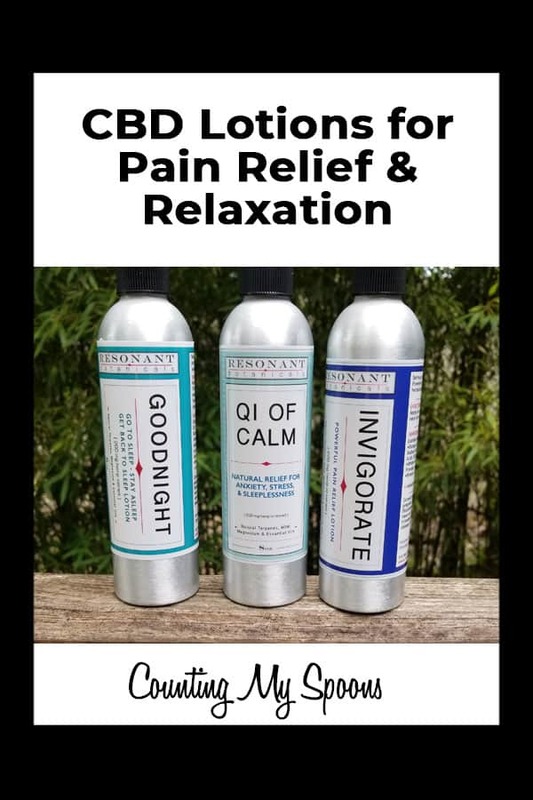 Resonant Botanicals latest CBD lotion is Goodnight. This lotion is designed to help you fall asleep easier and stay asleep. Since I began taking CBD oil nightly my sleep has greatly improved. When I received this lotion to try I started using it at night instead of the Qi of Calm, just to see what would happen. As timing would have it, after switching to a different brand of CBD oil and then switching back I began having some issues falling asleep again. I found that adding this lotion in did seem to help compensate for that. I was curious if it would help with the burning in my hands and feet the same way that Qi of Calm does, but so far that’s been a hard no. I don’t get any relief from dryness or burning from the Goodnight lotion, but that’s not what it’s designed for. My favorites are definitely the Qi of Calm (now known as Calm Day) and Invigorate lotions and they are now part of my regular pain-relief arsenal. These are products I don’t like to run out of and I definitely notice a major difference when I allow that to happen. What’s in a Migraine Cocktail? LOVE the scent of Invigorate. I think that’s partly why it works so well. It fades remarkably as the lotion is massaged into the skin and dries, so not too strong at all. Invigorate is my GO TO for sore muscles! Totally don’t want to be without it! I really am grateful you try and review products for us! I use a flat wooden spoon to “rub” my CBD lotion, essential ols in those hard to reach places on my back. It works well for me.